The 1800 Capped Bust Large Eagle Half Eagle is relatively available, but still very rare. The Philadelphia Mint kicked into relatively high gear with production of the 1800 Capped Bust Large Eagle Half Eagle. A total of 37,628 pieces were coined, although about 26,000 of them were actually struck in 1801. Heavy exportation and melting quickly diminished the supply of the 1800 Half Eagle, plus many other silver and gold coins during the early years of the United States. Bullion profiteers exploited the fact that US coins contained slightly more precious metal content compared to their European counterparts. For today’s numismatists, the 1800 is a little easier to come by than most Capped Bust Half Eagles, but they should never be considered common date material. Many type set collectors are pleased to “settle” for the 1800 Half Eagle and are willing to pay a handsome sum to acquire an example. 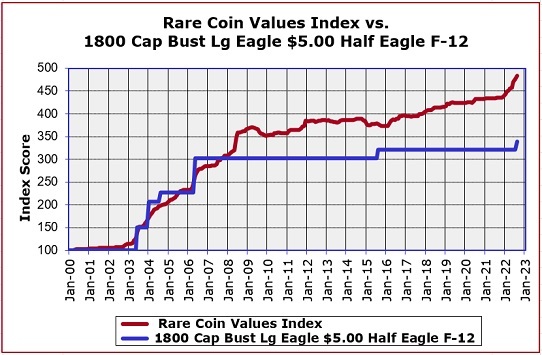 The percent value price increase since Year 2000 of the 1800 Capped Bust Large Eagle Half Eagle is depicted by the blue line above. The red line graphs the performance of the Rare Coin Values Index, which is actually the percent change in value since Year 2000 for a pre-selected group of 87 rare US coins. The goal of the Index chart is to understand the strength and direction of the overall rare US coin market. The 1808 Half Eagle is one of the 87 coins tracked in the Index, and mirrors fairly closely the Index. The Index is updated monthly.